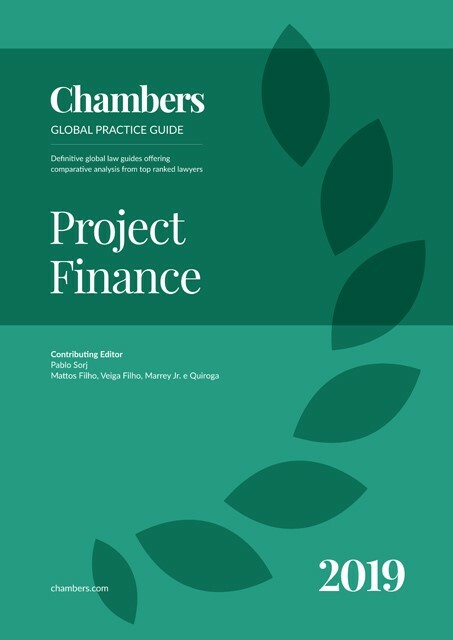 The Project Finance guide provides expert legal commentary on key issues for businesses. The guide covers the important developments in the most significant jurisdictions. Mattos Filho, Veiga Filho, Marrey Jr. e Quiroga Advogados has one of the largest and most respected Projects practices in Brazil, with more than 60 attorneys and trainees, including six partners. The practice has worked on some of the most sophisticated transactions involving infrastructure assets in Brazil, and represents lenders, underwriters, sponsors, contractors and multilateral agencies in complex transactions involving oil and gas, petrochemicals, thermal power plants, renewable energy, water and wastewater, mining, airports, ports, roads and rail, stadiums, and telecommunications. In recent years, the number of participants in global project finance markets has notably increased, as a wider range of lenders and sponsors, located in several parts of the world, have become active players. The capacity to fund large-scale projects and historical experience in cross-border transactions have led commercial banks to act as a traditional source of financing. However, the financial crisis and the change in the financial regulatory framework, such as the Basel III standards, have limited commercial banks' availability of credit and placed multi-sourced financing as the main structure to fill the funding gap worldwide. This means that large-scale projects have now been financed using more sophisticated and complex financial and legal instruments, provided by a diverse set of public and private institutions. In recent years, we have seen the diversity of market participants increase, including capital markets investors, Export Credit Agencies (ECAs), Multilateral Development Finance Institutions and government lending institutions. Notwithstanding the increased complexity, a combination of local market expertise, good commercial structure (and relationships), due diligence and robust security packages has helped ensure that the new structures are effectively used. However, despite a high demand for a greater number of projects, the market continues to be adversely impacted by instability of commodity prices and the political stress arising from global political events. Nonetheless, Americas project finance loans in 2017 reached USD64.3 billion, up 15.7% year on year, posting the second highest fourth quarter volume after 2015. The power sector accounted for 64.7% of the market with 157 deals that closed in the total amount of USD41.7 billion, up 5.1% from a year ago. EMEA (Europe, the Middle East and Africa) project finance loans totalled USD84.8 billion from 319 deals in 2017, down 44.3% year on year. The power sector posted a decrease of 84.5% in activity compared to 2016 with 219 deals adding up to USD38.2 billion. Asia Pacific and Japan project finance loans in 2017 amounted to USD80.4 billion from 258 deals, up 35.3% when compared to 2016 figures. South Asia showed a significant increase of 146% year on year to add up to USD21.4 billion from 101 deals. Although it is difficult to predict how the markets will react, in particular given concerns about political events and the global economy, the demand for infrastructure projects is as high as ever and growth of major project financings will likely continue. It is clear that structuring a project finance that includes multiple funding sources is becoming more complex every year. It is therefore key that market participants (including lawyers) be fully familiar with market trends and a diverse pool of businesses and risks associated with the projects. Nonetheless, despite all recent results and developments, project finance has frequently proved to be a resilient way to fund infrastructure projects.